Rock Resurrection Art : Rocking Stocking Stuffers! Gift something unique, hand made and affordable this Christmas! 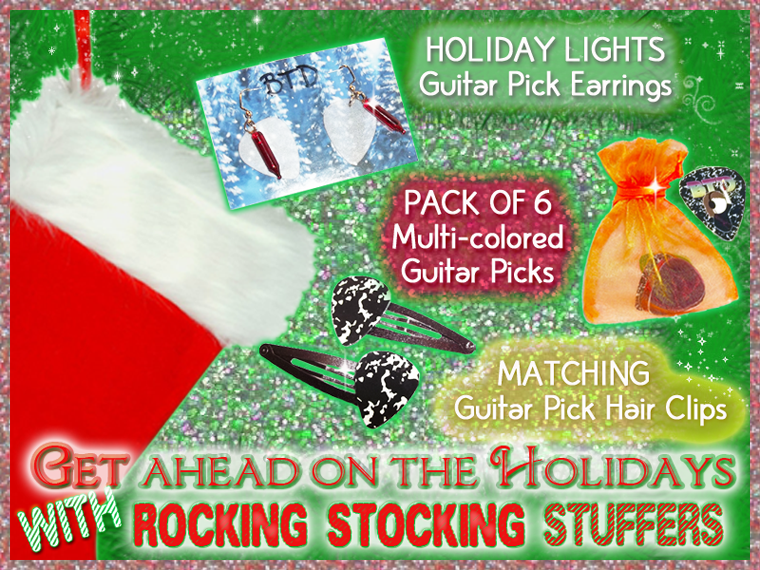 Holiday Lights Guitar Pick Earrings - Pick your colors! Guitar pick earrings with a different hue of Christmas light! Pack of 6 Multi-Colored Guitar Picks + FREE BTD Guitar Pick - Each pack features SIX colorful semi-transparent and solid guitar picks. Matching Guitar Pick Hair Clips - Pick your pair of guitar pick hair clips. You can also get your item(s) gift wrapped!